Making it categorically clear that having hydro projects, dams and barrages on the holy Ganga river is not acceptable to the saint community, revered religious guru Jagad Guru Shankaracharya Swaroopanand Saraswati ji Maharaj today urged Uttarakhand government to go for alternative power generation measures so as to ensure that sanctity and flow of the Ganga does not get hindered. Union Minister for Agriculture Harish Rawat today called upon Jagadguru Sharda-Dwarka Jyoti Peethadeeshwar Swami Swaroopanand at his Kankhal ashram here today. Taking an action on the announcement made by CM Vijay Bahuguna to make the state polythene-free, Dehradun District Magistrate Ravinath Raman has imposed a ban on the usage of the same. He said the polythene was harming the environment. People of Lohaghat and Pithoragarh are depending on hand pumps and tankers of the Jal Sansthan for water supply as natural sources of water have dried up. “As no new hand pumps have been installed at Lohaghat, the Jal Sansthan is supplying water through two tankers to people of the town having a population of more than 1 lakh. 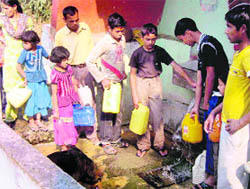 People wait for their turn to fetch drinking water from a natural source in Pithoragarh district. The Bengali community residing in the Shaktifarm area of the Sitarganj Assembly constituency is jubilant as the Uttarakhand Government has issued an order giving them ownership rights of the land they have been cultivating but not owned till date. “The 28,000 Bengali voters and their families have for the first time been given an identity by the government for which the community will express gratitude in the shape of votes on July 8,” said Gopal Krishan Mandal, former block pramukh of Sitarganj and prominent leader of the Bengali community. Reprimanding the state government for neglecting the interests of the tribal communities of Buxa and Tharu, chairman of the National Commission for Schedule Tribe (ST) Rameshwar Oraon said today that it had failed to check the dispossession of land of these tribesmen in Udham Singh Nagar. Ushering in greater transparency in the implementation of the Mahatma Gandhi National Rural Employment Guarantee Scheme (MGNREGS) in Uttarakhand, funds from the state to the districts would be electronically transferred along with keeping electronic records of must rolls. Uttarakhand Governor Aziz Qureshi reached Raj Bhavan at Nainital this afternoon after a two-day tour of Dehradun. He reached Haldwani from Dehradun by train this morning. He then went to Kathgodam, where he met several representatives of various groups and organisations at the state guest house. He also met the deputy chairperson of the minorities commission. Most of the people who met him submitted letters or memorandums regarding their problems. 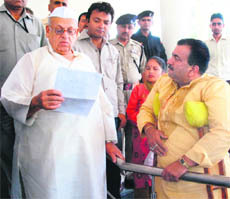 Uttarakhand Governor Aziz Qureshi meets physically challenged persons at Katgodam on Monday. MLA, Rajpur Road, Rajkumar, met Chief General Manager, Uttarakhand Power Corporation Limited, and asked him to follow the directions given by the Chief Minister for ensuring continuous power supply without any power cuts to the state. Kumar, who went with a delegation of his supporters, said the public was incensed over unannounced power shutdowns. A delegation of BJP Anusuchit Morcha led by president Amar Singh protested before the premises of Uttarakhand Power Corporation Limitedn (UPCL) for an hour against prolonged power cuts in the city. Singh also met Managing Director, UPCL, AK Johri and Chief General Manager, Anil Kumar, who assured them of quick effective measures in this regard. Uttaranchal Bijli Karamchari Sangh observed a one-day symbolic strike in pursuance of it's demands, which included revision of pay pension from January 1, 1996, onwards, increased DA to contractual employees from April 1, removal of discrepancies in promotions and enquiry into these and introduction of medical facilities. 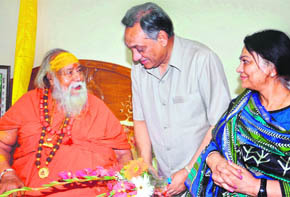 Jagad Guru Shankaracharya Swaroopanand Saraswati put forth this stance before Uttarakhand Chief Minister Vijay Bahuguna at his Kankhal-based ashram. Chief Minister Bahuguna called for a middle path, even submitting a memorandum to Shankaracharya, which cited necessity of having hydro projects in Uttarakhand. Though the revered guru made it clear that the holy Ganga river is not property of one state only. So this issue is of national importance and any decision taken in this regard should be mutually acceptable to all sections of society. Taking up this cause, the Shankaracharya is staging a protest at Jantar Mantar on June 18 in New Delhi to generate awareness about the negative impact of hydropower projects on Ganga river and local ecology. During this visit he will be taking this issue with Prime Minister Manmohan Singh and United Progressive Alliance chairperson Sonia Gandhi. On inviting Gandhian Anna Hazare and yog guru Swami Ramdev, Shankaracharya said that both are invited but had to come out with only cause of Ganga at the agitation venue as both had not spoken on holy Ganga issue during their year-long agitation. Shankaracharya stressed that hydro projects were affecting local ecology and sanctity of the Ganga and they opposed this move of shifting of this revered shrine. On the issue of natural, mineral quality ingredients in the Ganga river particles,Shankaracharya Swaroopanand pointed that due to numerous dams being made and Ganga being confined into cemented tunnels, it's anti-bacterial quotient is getting lost. He cited hydro projects being build at Panch Prayag at Deo Prayag, Rudra Prayag, Karan Prayag, Nand Prayag and Vishnu Prayag confluence of two rivers as having serious repercussions on the sanctity of the holy Ganga, which needs to be addressed. Chief Minister Vijay Bahuguna cited 68 per cent forest area coming under reserve category and limited employment-revenue generation at government's disposal, making hydro projects imperative to boost the economy of the hilly state. Citing neighboring Himachal Pradesh, which is selling electricity via various hydropower projects built on rivers, CM Bahuguna said that Uttarakhand had the potential to produce 27,000 MW electricity but till date was only generating 3000 MW, which is hurting the economy of the state, "as we are depending on outsourcing of high priced power from other states or national grid." At numerous occasions Vijay Bahuguna made it clear that any decision in this regard will be taken in consultation with the saint community, scientists, environmentalists, social activists and local people. The CM called himself as a 'devotee' of Shankaracharya Swaroopanand Saraswati. Accompanied by his wife Sudha Bahuguna, CM sought blessings from the Shankarcharya, who gave him blessings for victory in the upcoming Sitar Ganj byelection, adding that for the development of the state, people need Vijay Bahuguna as their Chief Minister. CM Bahuguna also recalled his father, former Finance Minister Hemwati Nandan Bahuguna's association with Shankaracharya, and termed it 'a moment to cherish' visiting the revered guru being in chief ministerial post. They had a discussion on the issues of the Ganga cleaning and hydro power projects being build on the Ganga and its adjacent tributaries. Jagadguru Shankracharya informed Harish Rawat about the June 18 agitation on saving Ganga at Jantar Mantar in New Delhi. The minister also sought the blessings of the revered guru and promised support to make the Ganga clean. Harish Rawat told Jagadguru Shankarcharya about his recent clean-Ganga drive. Jagadguru said dams, barrages and hydroelectric projects on the Ganga were hampering the flow of the river. He said he would meet Prime Minister Manmohan Singh and Congress chief Sonia Gandhi in this regard. Later, talking to mediapersons, Harish Rawat termed it as a courtesy visit in which he sought the blessings of the revered guru. People of Lohaghat and Pithoragarh are depending on hand pumps and tankers of the Jal Sansthan for water supply as natural sources of water have dried up. “As no new hand pumps have been installed at Lohaghat, the Jal Sansthan is supplying water through two tankers to people of the town having a population of more than 1 lakh. Other two tankers, which were allocated to the Sansthan recently, had been sent to the Purnagiri fair at Tanakpur in Champawat district,” said Bhagwan Singh Rawat, president of the Pithoragarh Lok Manch. According to residents of Lohaghat subdivision, the Jal Sansthan is supplying water every third day as it lacks a sufficient number of tankers. “Not only the residents of Lohaghat town but also the people of nearby Forti village are dependent on the lone operational hand pump in the town, as the drinking water scheme meant for the village has gone dry due to summer heat,” said Shankar Bagauli, a resident of the town. The local Congress leaders are blaming policies of the former BJP government for the drinking water crisis in the district. They said despite ruling the state for five years the BJP had never given priority to the water problem. “Had the BJP given priority to the problem, it would have changed hand pumps at the main scheme meant for the town. It would have also changed the pipelines connected to it,” said Mahendra Singh Lunthi, president of the District Congress Committee. The Goralchaur area of Champawat district is facing a drinking water crisis during the season as all natural water sources have gone dry and the villagers could not get water from these. “We have deployed four pickup vans and one tanker to supply water to the residents of the Forest Colony, Nagar Panchayat campus and the GIC campus all these day,” said Pradeep Joshi, a Jal Sansthan engineer. To ensure a sufficient supply of drinking water to the residents, the Champawat district administration has banned the use of electric pumps to lift water in the town. “These pumps are creating problems for other residents as they draw most of water supplied from the source. Therefore, we have started a campaign to take action against those who defy the ban,” said a Jal Sansthan official in Lohaghat. Residents of Sinyari on the Tanakpur-Pithoragarh road were demanding repair of the lone hand pump that had gone dry two years ago. “Due to the non-functioning of the hand pump, not only local shopkeepers but also passengers plying on the road are facing a drinking water crisis during the summer,” said Shish Ram Chaurakoti, a local resident. 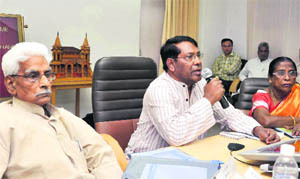 Mandal said the order sent by the Revenue Secretary on May 30, 2012, said the state government had taken a decision that the land obtained for agriculture purpose under the Government Grants Act 1895, having hereditary rights on the land, will be regularised only if the land is being used for cultivation only. “The government order said the ownership rights could be not more than 18 acres for un-irrigated and 12.5 acres for irrigated land, which is prescribed under the Maximum Cultivation Limit Act of 1950,” said a government official at Rudrapur, district headquarters of Udham Singh Nagar district. He said the order covered only the land which had been granted to lease holders for 30 years or more. “At present the situation is highly favourable for Chief Minister Vijay Bahuguna, who is expected to reach Sitarganj on June 13 to file nomination papers, as the BSP and the SP have not decided on their candidates. The BJP is also yet to decide on its candidate. These parties are likely to give a walk over to Vijay Bahuguna,” said Mandal. Some posters have surfaced in the Sitarganj area stating that the forefathers of Chief Minister had come from Bengal to the Garhwal Himalayas. “These posters claimed that Vijay Bahuguna’s forefathers migrated to Garhwal in the thirteenth century and on reaching the court of the local king, treated the prince successfully. He was gifted Budhani village by the King in return. They claimed that the Vijay Bahuguna family had also migrated from the eastern part of Bengal from where the Bengali migrants living at the Shaktifarm had come from,” said Mohan Rajput, a senior journalist based at Rudrapur. Still in a fix, the BJP leadership has yet not finalised its candidate to face the Chief Minister in the byelection. Local BJP legislator Kiran Mandal had resigned after the Chief Minister promised to grant ownership rights of the government land to the Bengali community. “Not only are the living conditions of these tribesmen abysmally poor in comparison to other communities, but all their land has also fallen into the hands of other communities when they should have been given protection under the Prevention of Atrocities Act, (1989) and their land restored,” said Oraon, while briefing mediapersons after a state-level meeting on the ST. The Chairman said no case of atrocities had been registered with the state commission or the national commission. The national commission would still take up hearing on the land issue in Delhi. He also said in the past five years, only 53 per cent of the budget under the tribal subcomponent plan in the state was utilised. “It points out to the gross inefficiency as the departments could not plan schemes under the budget,” he said. Significantly, the Chairman said despite the clearance of the Forest Rights Act, its implementation continues to be poor in the state. “When Parliament was in the process of making the law, several officials had raised their voice against it. Now these officials have been entrusted with the task of implementing the Act. No wonder there is all round resistance,” he said. He also said during the national commission’s field visit to Mana in Chamoli district, the tribals of the area pointed out their community rights over ‘padavs’ (halts) were being usurped. “These communities while migrating to the upper reaches have been using the ‘padavs’ as resting points but now these too are being taken away. The poor implementation of the Forest Rights Act is responsible for such lapses,” said Oraon. Significantly, the commission could also prevail upon the state government to create an advisory committee for the ST in the state, a matter that has been pending for the past ten years. The commission also said they would also look into the demand of the ST status for people living in the Rawain and Jaunpur regions of the state. Though falling in the backward areas, the people have not been granted the ST status. In order to encourage girls belonging to the ST to take up higher education, the commission also recommended the construction of hostel for tribal girls in Dehradun and other cities. As part of the pilot project, Dehradun district has been selected for the implementation of the electronic fund management system (EFMS) and this exercise is expected to be taken up in the entire state by the end of the year when more than 10 lakh job card holders would have electronic records of their must rolls. “The exercise would curb delays in payment and also help us monitor the flow of funds from the state to the district,” said Om Prakash, Principal Secretary, Rural Development. Besides, the Central government has also in principle agreed to allocate funds under MGNREGS under in instalments. Talking to mediapersons, the Governor said that among his priorities was ensuring the development of pilgrim and adventure tourism in the state. “There is immense potential for tourism in the hill state,” said Qureshi. He said that there was a need for developing an action plan for improving the Char Dham yatra with support of the local people and dharmacharyas. The Governor said that during his visit to Badrinath shrine (by road) from May 23 to 25, he found that there was a great need for improving drinking water facilities, public conveniences, health and food facilities as well as amenities for resting. He said that developing destinations for adventure tourism as well as enhancing lesser known places in the hills would place Uttarakhand on the international tourism map. The Governor said that in order to establish the state as an excellent centre for education, he would, in his capacity as the Chancellor, ensure that the universities conformed to the UGC guidelines and standards. “Attention will also be focussed on providing employment-oriented education, which would help the youth of the state to get jobs based on locally available resources,” said the Governor. He said most of the drinking water resources of the state were dependent on tubewells, which were not having generators. He made it clear that if the cuts were essential, then a time table of power cuts, area wise, must be publicised in local dailies so that the public could be informed well in advance about that. Amar said the Congress first broke the back of public with inflation; then with constant fuel hike, and now with the unannounced recurrent long power cuts. He said the power cuts had also affected the supply of drinking water. Ashok Verma, general secretary, said they would hold a meeting of the union on June 17 and would decide about the next course of action if their demands were not met by then.